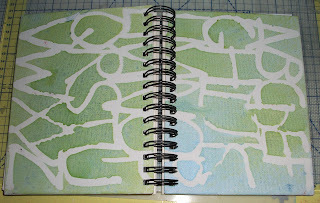 Clouds background was made using clarity stamps Cloud mask and Stormy skies Adirondack ink, flowers are Indigoblu stamps coloured with Pan pastels rest is freehand. Some people are actually doing their artwork in an old dictionary , I have bought myself a sketchbook from The Range, I chose it as it had a white canvas cover that I could customise, so far it has just been spritzed through one of Ali's masks with Cosmic Shimmer Mica Shimmer Mists. I'm sure this will be added to. An interesting fact I have always hesitated about altering books as I have always been a great lover of books... and then I heard someone say that the majority of secondhand hardback books end up in landfill, so i have changed my mind and whenever I find a hardback book in a charity shop I will buy it to recycle it and give it a new lease of life. 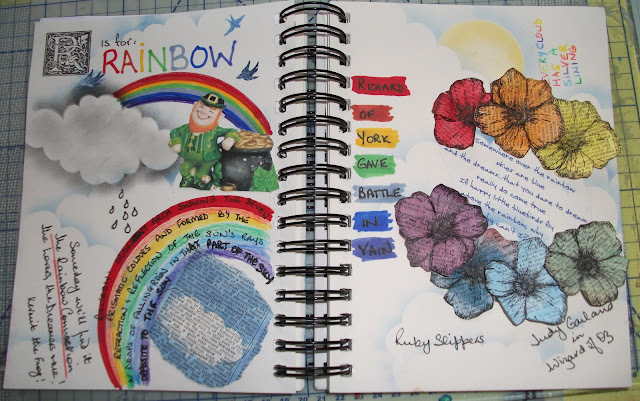 Fabulous rainbow pages, look forward to seeing more. Lovely bright colourful page. Good luck catching up with the previous letters! I don't think this is basic at all. I love the colours and your pages have so many different references to rainbows but all the elements work together so well. Gorgeous cloudy sky and lovely bright colours. I don't find this basic either. I find it charming. Love the lyrics to the songs, the reference to a leprechaun, and the glorious rainbows. 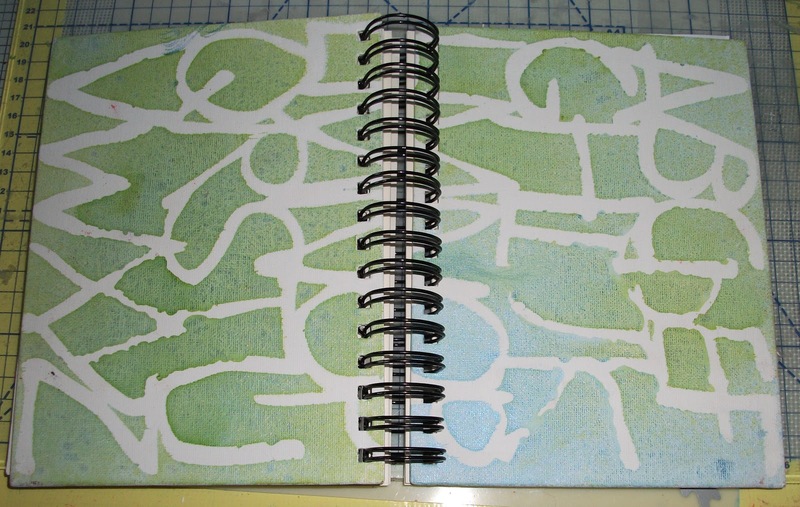 One thing I have learned about art journaling is that everyone has their own style and each style is wonderful and evolves with time. Love all the rainbow effects and what you have done to the front cover of your sketch book. Can't wait to see that grow. Wonderful rainbows. I really like the rainbow colored flowers. So beautiful and colorful - now you have me singing "somewhere over the rainbow"